Hooray for Enchiladas! I’ve decided to make an enchilada recipe for dinner tonight… one that I’ve made a zillion times and have never gotten a photo of- Asparagus and Chicken Enchiladas. My father used to make these enchiladas for me every time I came to visit. They are so creamy and delicious, and I’m excited to (finally) try and snap a good photo. Enchiladas aren’t the easiest of dishes to photograph. They end up looking like a sloppy mess most of the time, even though they are incredibly delicious to eat. 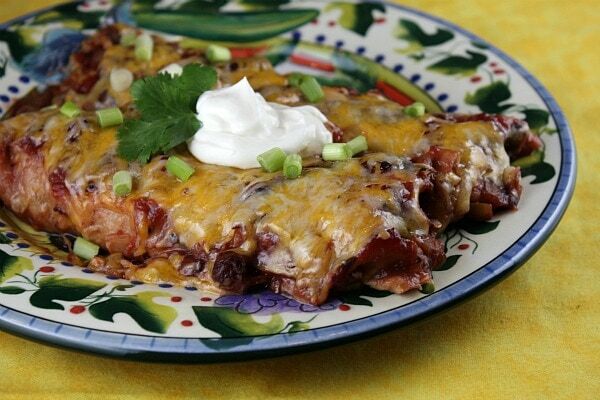 Here are 20 fabulous enchiladas recipes from some of my favorite food blogs. 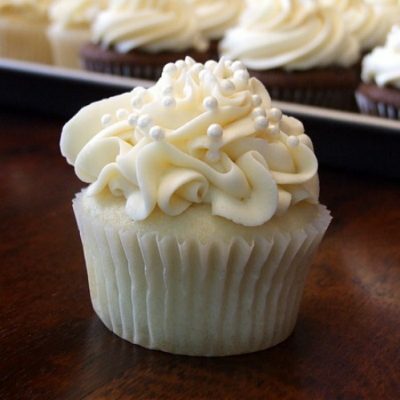 Find a favorite and click the title to find the recipe. 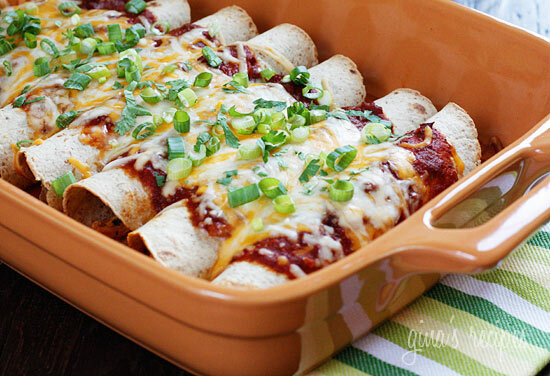 Easy Beef Enchiladas by RecipeGirl– Like the title says, these are just easy enchiladas with a homemade sauce if you’re so inclined to make it. My family loves these. 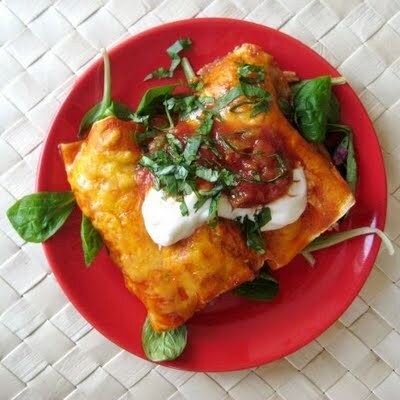 Beef and Black Bean Enchiladas from Mango & Tomato– Since my family loves my beef enchiladas, I’m guessing that an addition of black beans might be in order too. 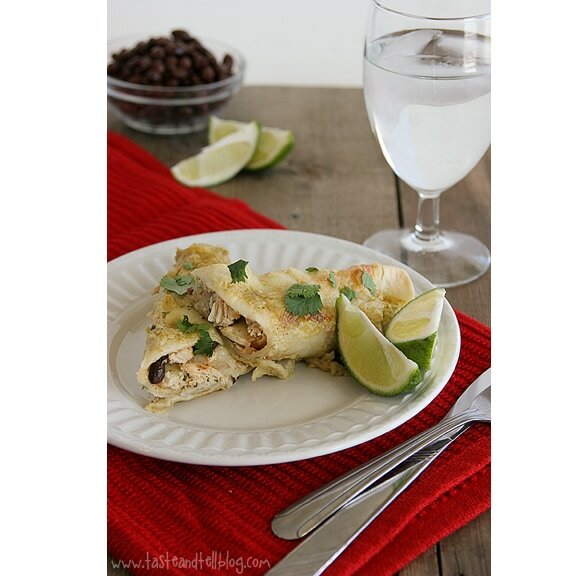 Creamy Chicken Enchiladas by RecipeGirl– Super creamy and a bunch of good stuff on top too. I love these enchiladas big time. 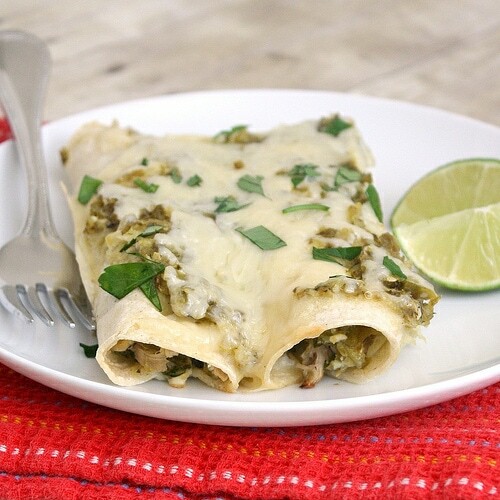 Chicken Enchiladas Verdes by Simply Recipes– Elise pretty much has the best recipes on the internet, so if you’re wishing to try the green version of enchiladas, this is your recipe! 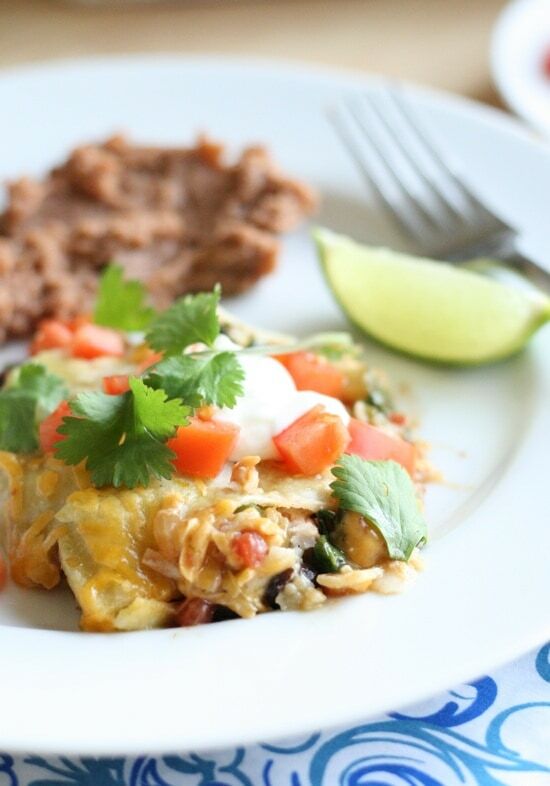 Chicken and Black Bean Zucchini Enchiladas by Taste and Tell– These just look yummy. And a squeeze of lime is perfect. 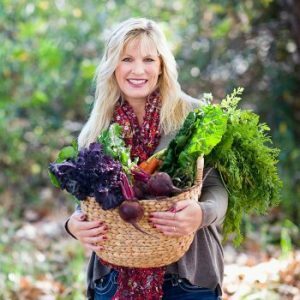 I love everything from Deborah’s blog. 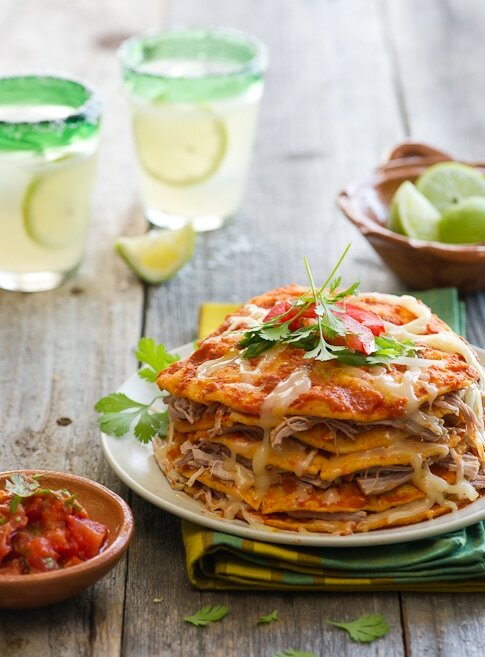 Chipotle Pork Enchiladas by White on Rice Couple– I think these are too beautiful to eat, but chipotle-pork in an enchilada sounds absolutely delightful to me! 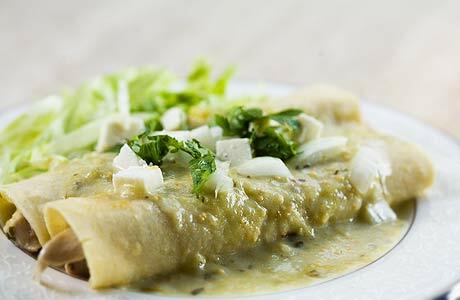 Shrimp Enchiladas Verde by Eat Live Run– Shrimp in an enchilada is a very good idea indeed! Sweet Potato and Black Bean Enchiladas by Gluten Free Goddess– A gluten-free option here- sweet potatoes are a fabulous idea to stuff inside of enchiladas! 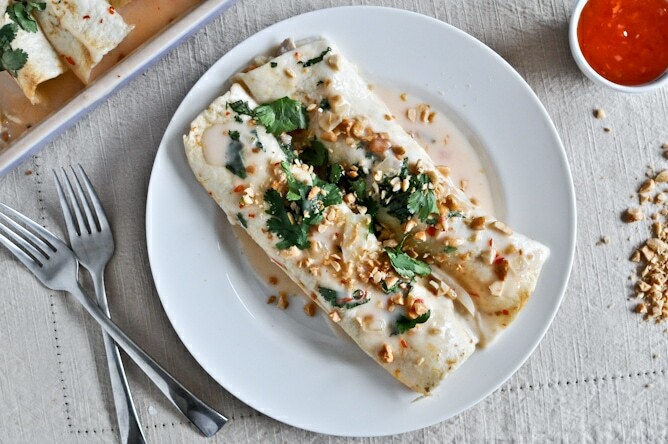 Skinny Chicken Enchiladas by SkinnyTaste– A skinny version of enchiladas is always welcome. Weight Watcher’s points and nutritional information is included on these. 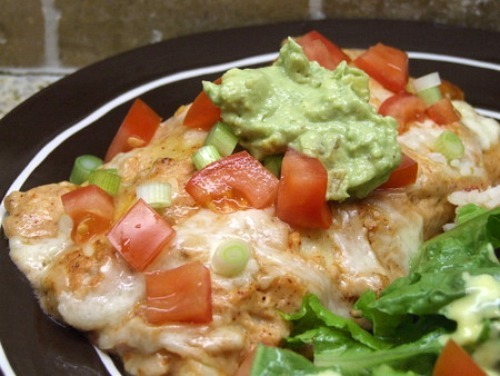 Lighter Chicken Enchiladas Verdes by Tracey’s Culinary Adventures– Another light enchilada recipe! 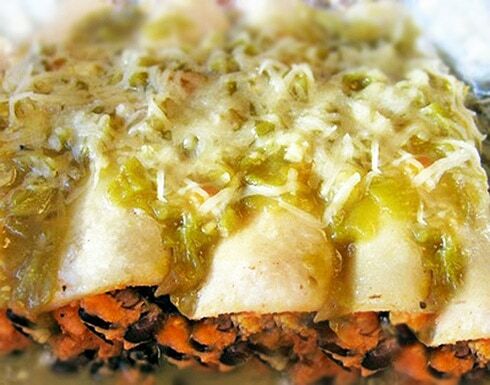 Light Bean and Cheese Enchiladas by Noble Pig– yet another light option- yay! Cranberry Turkey Enchiladas by RecipeGirl– an alternative flavor for enchiladas… I know they sound bizarre, but you’ve gotta trust me on this one- they are soooo good! Buffalo Chicken Enchiladas by The Novice Chef– another alternative flavor for enchiladas, introducing “buffalo chicken!” Sounds great to me! 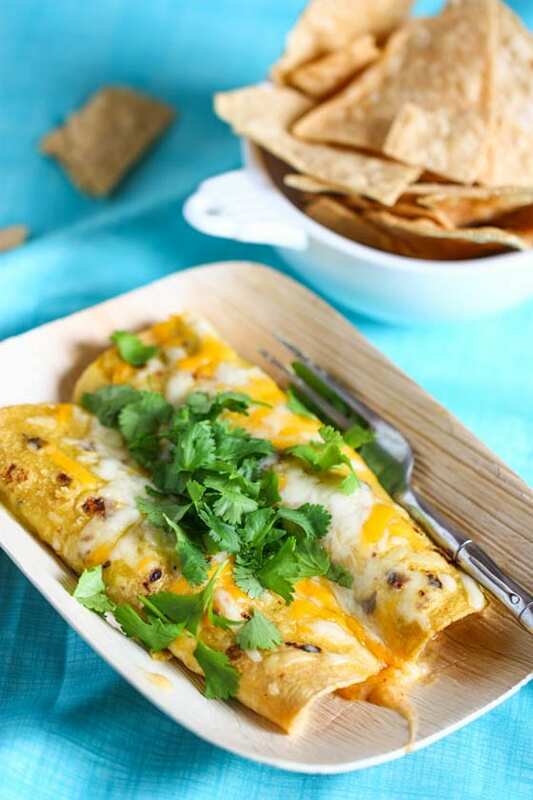 Thai Chicken Enchiladas by How Sweet It Is– Leave it to Jessica to come up with something totally different for an enchilada. I’m excited to try this one! Stacked Roasted Vegetable Enchiladas by Two Peas and Their Pod– Since roasted vegetables are good by themselves, let alone when included in a main dish, this one has got to be fabulous. 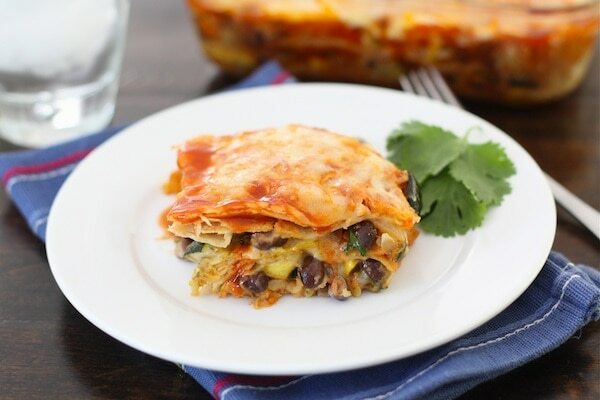 Enchilada Lasagna by Lauren’s Latest– Veering off into enchilada-themed dishes, this “lasagna” looks intriguing too. 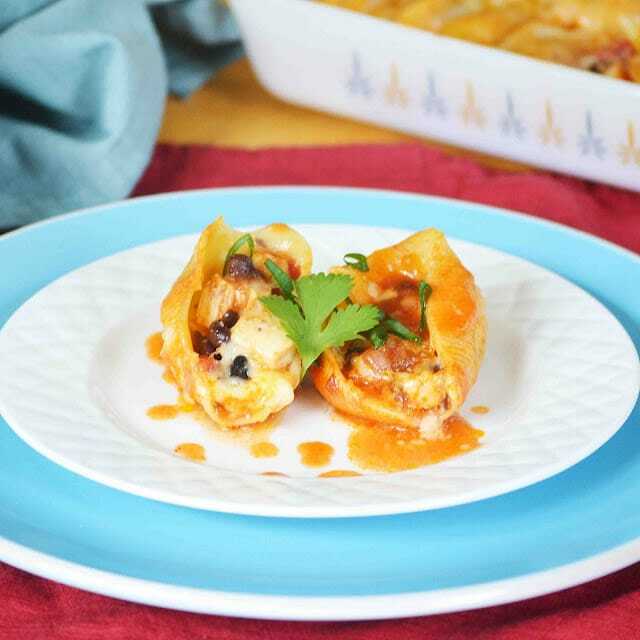 Black Bean and Chicken Enchilada Stuffed Shells by Bakeaholic Mama– Stuffing enchilada filling in to pasta shells is a rather good idea too. 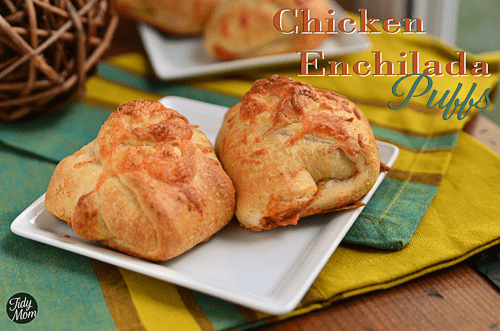 Chicken Enchilada Puffs by TidyMom– And stuffing enchilada stuffing into crescent pastry to create a meal is something that might work well for your family dinner. Hope you found some enchilada love in all of this delicious madness. Happy Cinco de Mayo weekend to ya! 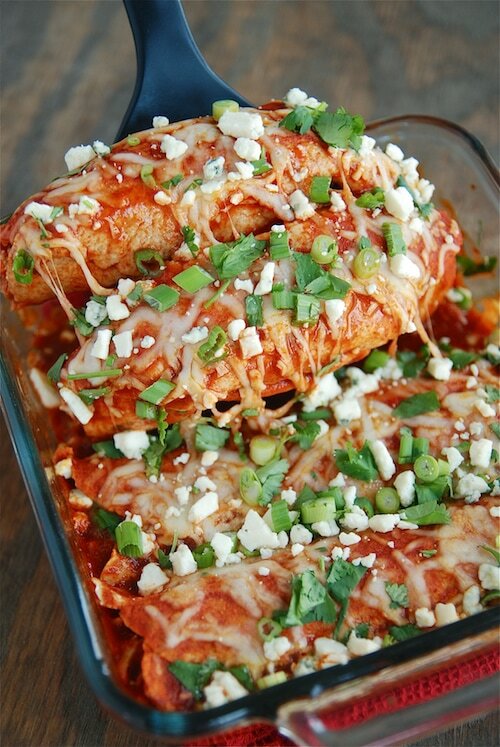 Now this post just made me super super hungry, I think enchiladas are my favorite meal! I may have to cook my way through each and every one of these! Yay for enchiladas! They are my fave and I really love this round-up! No matter which recipe you try first, second, third.. nineteenth – a good secret is that whatever chile sauce you plan to use, MAKE EXTRA. Take some of it and stew the meat filling first, over a low heat, then stuff the enchilada and bake as normal. So use that sauce inside and out. 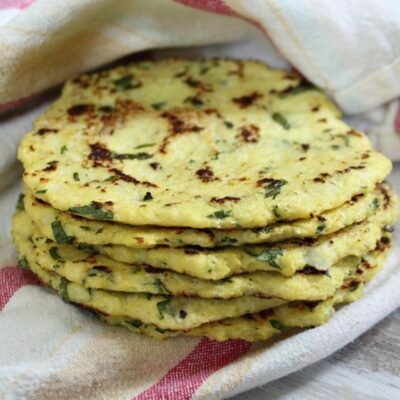 Spread a thin spoonful on the inside of the softened tortilla with the back of a spoon, before adding the meat filling. Then, when spooning the filling into the tortillas, use a slotted spoon to bring out the meat, leaving the sauce in your pan for spooning over the top with the cheese, sprinkle with fine chopped black olives. Also: Wait 5 minutes after bringing the dish from the oven, before digging in. Don’t serve immediately or the dish won’t have time to set up and it will seem disappointingly goop-gooey. This list is fantastic. I was so inspired, I made your asparagus enchiladas last night, subbing green chili for the onions. They are now my favorite. Thanks for sharing. Such a great roundup! These look absolutely delicious, Lori! 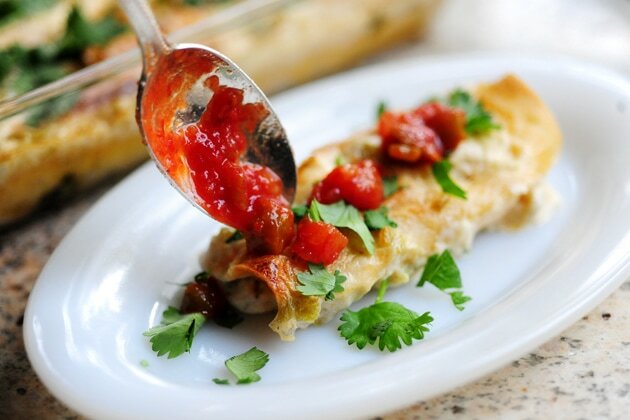 So many delicious enchilada recipes all in one place! I’ve got a lot of tex-mex to get to eating, that’s for sure! 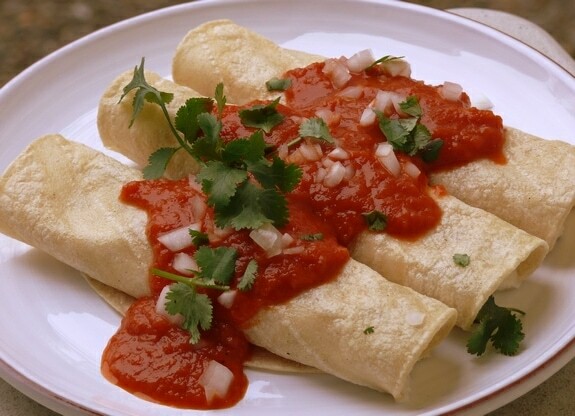 I’m craving enchiladas right now! Everything looks great, would be a hard decision to pick just one! Yum! They all look fantastic! It would be hard to pick one recipe to make!! 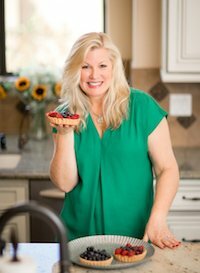 What an honor to have my recipe shared with such a great group of bloggers. Thanks so much Lori… everyone’s dishes look fabulous! 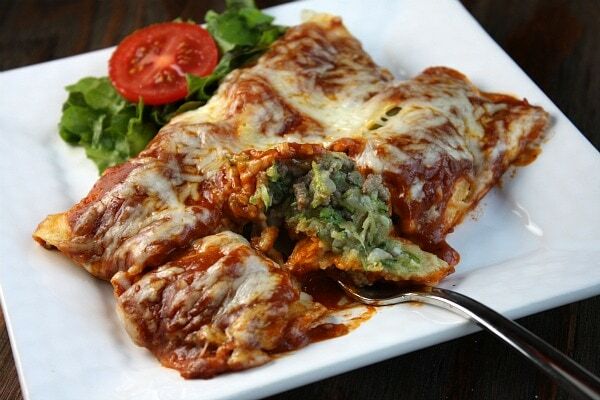 Your enchiladas look so good. Thanks for sharing all these recipes!